Rapid technology change is impacting organizations large and small. Mobile and Cloud computing, the Internet of Things (IoT), and "Big Data" are driving forces in organizational digital transformation. Decision support and analytics are available to many people in a business or organization. Business professionals need to learn about and understand computerized decision support for organizations to succeed. This text is targeted to busy managers and students who need to grasp the basics of computerized decision support, including: What is analytics? What is a decision support system? What is "Big Data"? What are "Big Data" business use cases? Overall, it addresses 61 fundamental questions. In a short period of time, readers can "get up to speed" on decision support, analytics, and business intelligence. The book then provides a quick reference to important recurring questions. xiii, 178 pages : illustrations ; 23 cm. 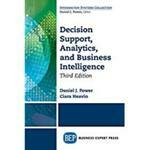 Power, Daniel and Heavin, Ciara, "Decision Support, Analytics, and Business Intelligence" (2017). Faculty Book Gallery. 450.